Fight broke out between Lelean Memorial School and Cuvu College Under-18 players during the Powerade Super Deans Rugby Championship U18 quarterfinal at the ANZ Stadium, Suva on July 28, 2018. Photo:Ronald Kumar. Cuvu College were not car­ried away with their 20-14 win over Lelean Memorial School in the Powerade Super Deans Championship Under-18 quarterfinal at the ANZ Stadium, Suva yesterday. Cuvu College principal, Navneet Mishra told SUNsports that they need to remain focused on their semi-final clash next Saturday. The Nadroga-based school is also the academy for the French Top 14 club Clermont. 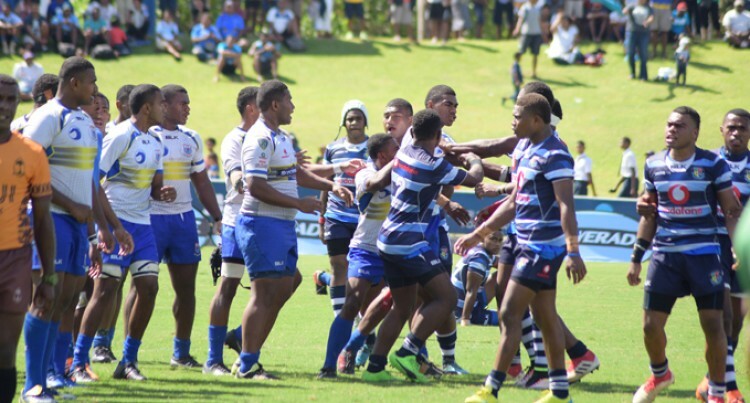 What happened: Cuvu College started strongly and pressured Lelean into mistakes. In the 10th minute Cuvu got a penalty and first five eight Meli Nalumekata converted it for a 3-0 lead. Towards the dying stages of the first half Cuvu increased their lead through a try by No.8 Josateki Tu­ituba with Nalumekata adding the extras from the conversion. Both teams came out firing in the second half. Lelean fought hard and scored two converted tries while Cuvu kept on the momentum with Nalumekata’s second penalty going over and Tuituba driving over for his second try which was converted. Comment: Cuvu College principal, Navneet Mishra said: “I would like to thank the players for the mas­sive game that they have showed today.